The month of October brings us new tidings. Whilst many await the end of the month for their annual horror movies with their pumpkin chai lattes, we at Chaleuria have decided that we’ll dedicate a new novel to those who can’t deal with horror (aka scaredy-cats like me! Who else has those issues too? :P). 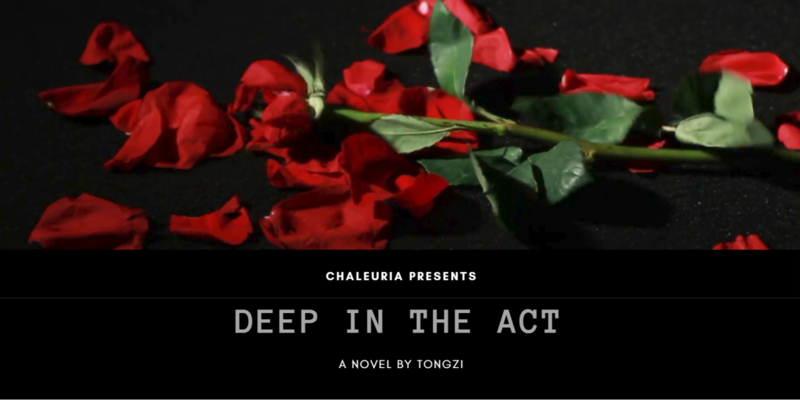 We are pleased to introduce our latest addition, Deep in the Act by Tongzi. Kotoni who helms this project (many of whom will recognize her as the translator in training from TLCPS) introduced it to me a few months ago and I fell absolutely in love with the story. Haven’t you’ve ever wondered what could potentially happen when an actor gets too in-character? We’ve seen method actors on screen go to great lengths but how much is too much? Here, Tongzi spins an intriguing tale that will keep you at the edge of your seats. PreviousChaleuria welcomes The Complete Guide to the Use and Care of a Personal Assistant!